Check the Fien Print: MovieWatch: "I Am Legend"
In a Nutshell: I actually went out to see "I Am Legend" on an IMAX screen -- something I don't usually do -- because I wanted to see the first six minutes of "The Dark Knight." Unlike "I Am Legend," which was shot in a standard format and augmented for the IMAX screen, parts of Christopher Nolan's sequel to "Batman Begins were actually shot in 70mm, including the opening. A seemingly standard-issue bank heist that introduces Heath Ledger's Joker, the six-minutes were probably enough to convince me that when I see "The Dark Knight," it'll be in IMAX. The sheer enormity and detail of the prelude was outstanding, with the opening Gotham cityscape -- daytime, probably Chicago -- proving unexpectedly breathtaking. The dialogue cracked, William Fichtner has a kickass early appearance and Ledger looks to have taken the Joker character in a new and different direction. I'm probably anticipating "The Dark Knight" more than any other film next summer, including "Indiana Jones and the Quest for Profit." 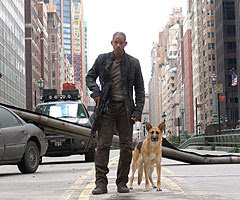 As for "I Am Legend," the movie was probably better than I expected, since my expectations were fairly low. For at least an hour, it's a moody, evocative, depressingly thrilling studio ride, all anchored by a performance from Will Smith that's sure to be underrated. It's a bit of a dead end by the conclusion, but at least Mark Protosevich and Akiva Goldsman's script doesn't 100% turn on Richard Matheson's novel. More on that later. After the bump. And the appropriate spoiler warnings. Goldsman and Protosevich have cobbled a Frankenstein's monster of a script that pulls in elements from both Matheson's short novel, but somewhat more from the 1971 Charlton Heston "classic" "The Omega Man." If you're familiar with both source materials, it's easy to imagine them pulling plot points from one and then the other, picking and choosing. The thing, and I think I've said it before, is that "I Am Legend" presumably cost well over $100 million to make, but a straight forward adaptation of Matheson's novel could be made for a tenth that, even with a recognizable star. With a box office behemoth like Smith, you could still adapt Matheson for, say, $50 million. With "28 Days Later," Danny Boyle proved you can make a city look evacuated on a shoestring budget if you're clever. With "The Descent," Neil Marshall showed how darkness and a well-spent costume budget showed how creature-based terror can also be executed on the cheap. Francis Lawrence, who also directed the rather awful "Constantine," is giddy with the idea of turning New York City into a ghost town (in the book and "Omega Man," it's LA). The first 20 minutes of the movie is one pull-back shot after another to expose the desolation of Times Square, Washington Square, the Met, etc. It's all done with a rather heavy computer assist, because it isn't enough to have Manhattan empty, you have to also get a corn field growing next to the TKTS line. I'm not sure on the agricultural believability there, but it's no biggie. Extra expense is thrown in, for no meaningful reason, to show herds of deer racing through the city. Granted that viewers are likely to appreciate the overkill, it's overkill nonetheless. Expensive overkill. For me, the shots that were provided by cinematographer Andrew Lesnie were better than the ones manufactured by the effects house. The movie's best special effect, and hardly its cheapest, is Smith. At least a half-dozen times during the movie I found myself thanking the studio Gods that the long-gestating project never went forward with Arnold Schwarzenegger in the lead. With movies like "Predator," California's governor proved he's capable of being the only actor on the screen for large periods of time, but Smith's likeability holds "I Am Legend" together. He's able to find rueful humor where few actors could, he's convincingly physical and, mostly, he holds the screen when nobody else is around. He's acting with mannequins and a dog for most of the time, but despite the lack of human bounce-back, his energy never falters. I also appreciated the filmmakers' willingness to let Smith's Neville be just as nearly deranged as you'd expect a man to be if he'd spent 1000 days in a concrete jungle battling unseen creatures. Since Smith is mostly talking to himself (or his wonderful German Shepherd Sam), the dialogue is minimal, which is good because the more he talks, the more clumsy the movie gets. One of the writers must have had what he figured was an epiphany that the perfect soundtrack to "I Am Legend" would be Bob Marley's "Legend." Unfortunately, having moved beyond the coincidental names, that writer had to add scenes justifying the linkage, somewhat to the movie's overall disadvantage. That's one of those things where a writer is better off letting the audience decide if they want to connect the dots, rather than forcing the issue. "I Am Legend" is hardly an art movie, but it occasional exhibits an indie movie's willingness to let viewers connect the dots. Many aspects of our hero's day to day life are left to the viewers' imaginations. Everything from the final decline of humanity to how Neville came to have key works of art hanging in his apartment are hinted at if you care, but left unspoken. I think a similar less-is-more approach would have been better for the creatures as well. In Matheson's "I Am Legend," the adversaries are called vampires. In "Omega Man," they're far closer to albino zombies. In this "I Am Legend," they're called "Dark Seekers" and beyond the idea that they're wicked fast, wicked agile and wicked hungry for living human flesh, we don't learn much about them. They're scary, but the best scenes of the movie are mostly Smith dealing with his own paranoia and the traumatic memories of what happened to his wife and child. In Lawrence's vision, the Dark Seekers aren't capable of speech and they're mostly computer generated whenever possible. One of the most haunting aspects to Matheson's book is the idea that the creatures still have some vestigial memory of their former lives [like the hero's neighbor returning to his house every night wailing "Neville!"] and one of the most scary aspects is that they're learning. "Omega Men" went a little overboard on this, to the point that the zombies' speech patterns have become weirdly colonial or Victorian without explanation. The most provocative idea in the book, in my opinion, is that the creatures are an extension of human evolution, that Neville's resistant DNA might be the unacceptable mutation, not theirs. The creatures are ready to open up shop on a new level of humanity and they're being tormented by this regressive Old Human. Neville is the insurgent preventing them from restoring order. Lawrence's "I Am Legend" doesn't get close to that and the ending of the movie suffers accordingly. The idea that the Dark Seekers are becoming less scared of the light and that they're maybe capable of setting traps is mentioned, but never realized. The creatures just grunt. I've got to admit that I really like this movie, I think Will Smith does an excellent job and his dog sidekick adds a lot to the film. Glad they decided to adapt it away from the vampire like novel it orginally was. Here is a cool link I found for an "I Am Legend" Fan Site. I read the book, saw the movie, and gotta say that I liked them both for what they are. Though I would've loved to have seen a closer rendition of Matheson's "Vampires". I think it would have been much more impacting and disturbing, but I didn't expect Hollywood would live up to my expectations there. Too much emphasis on CG and special effects these days. In the end, Will Smith (and his dog Sam) made the movie...aside from his talent, of course, the shirtless pull-ups were no hardship to watch!